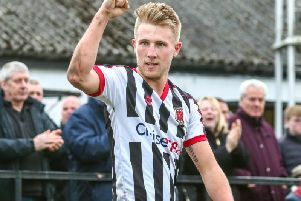 League leaders Chorley’s 100% record remained intact after this hard-fought contest, enabling the Magpies to move four points clear at the top of the National League North. Blyth put up a spirited fight, even when two goals down, and when Robbie Dale converted a 78th-minute penalty to reduce his side’s arrears, Spartans became the first team to score against Chorley this season after over eight-and-three-quarter hours of play. The hosts got in the first meaningful shot of the match after six minutes when hot-shot Danny Maguire stung Matt Urwin’s hands with a fierce drive. But after weathering a spell of home pressure, the visitors threatened a goal twice before the interval. Elliot Newby crossed to his brother Alex, whose goal-bound header was cleared off the line by a defender, and then keeper Peter Jameson at full stretch brilliantly pushed around the post a well-directed Marcus Carver header from Matt Challoner’s inviting cross. The competitive nature of the game was typified by the issuing of five yellow cards, three to Chorley players, before half-time. The Magpies looked increasingly more likely to fashion a goal in a compelling second half and deservedly got it on 66 minutes when Elliot Newby was brought down just inside the box. Alex Newby stepped up to confidently dispatch the spot-kick. Four minutes later, Chorley went two up courtesy of a stunning strike from Josh Wilson. Fastening on to a long ball, Wilson comprehensively beat Jameson with a superbly-struck cross-shot into the top corner of the net. Blyth, however, were not done and reignited the contest with Dale’s penalty, following an ill-judged challenge on the same player by Courtney Meppen-Walter, who received a second caution and was sent off. Spartans threw everything into a late rally but the Chorley defence stood firm, Urwin earning his wages with a stunning save, flinging himself to his left to parry to safety a powerful volley from Sean Reid. ‘This was one of our toughest tests,’ said boss Jamie Vermiglio. “We want to try to win every game and came here to attack and in the end got what we deserved. “It was a disappointment to concede our first goal of the season but it took a penalty to do that, so we are still unbeaten in open play. CHORLEY: Urwin, Challoner, Blakeman (Cottrell 46), Teague, Leather, Jordan (Meppen-Walter 11), A Newby, O’Keefe, Carver, Wilson (Anson 79), E Newby. Subs (not used): Almond, Whitham.